Fleeing one’s home country is a traumatic experience. Refugees feel anger, fear, sadness and even shame. They often feel betrayed by the government or even by their own people. During their flight, injury, robbery, and separation of families are all too common. Sadly, their suffering doesn’t end there. Resettling in another country (usually not the refugee’s first choice) forces them to adapt to unwelcomed conditions and uncertain futures. Trust and interpersonal skills deteriorate, which are two necessary components in healing. The biggest trial they face is learning to live again. It only takes $20 to cover one session of CRP’s art club. 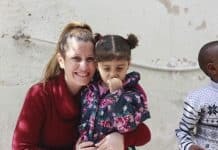 Help Ruba and others like her now. There are tremendous weights that hang on Ruba’s and other refugees’ shoulders. But our CRP staff sees growth in our beneficiaries as they participate in psychosocial and trauma-relief programming. 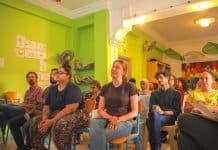 Some refugees walk in with heads down and won’t make eye contact, but after some months we see them smiling and engaging in all sorts of energetic conversations. Ruba is one of those people. 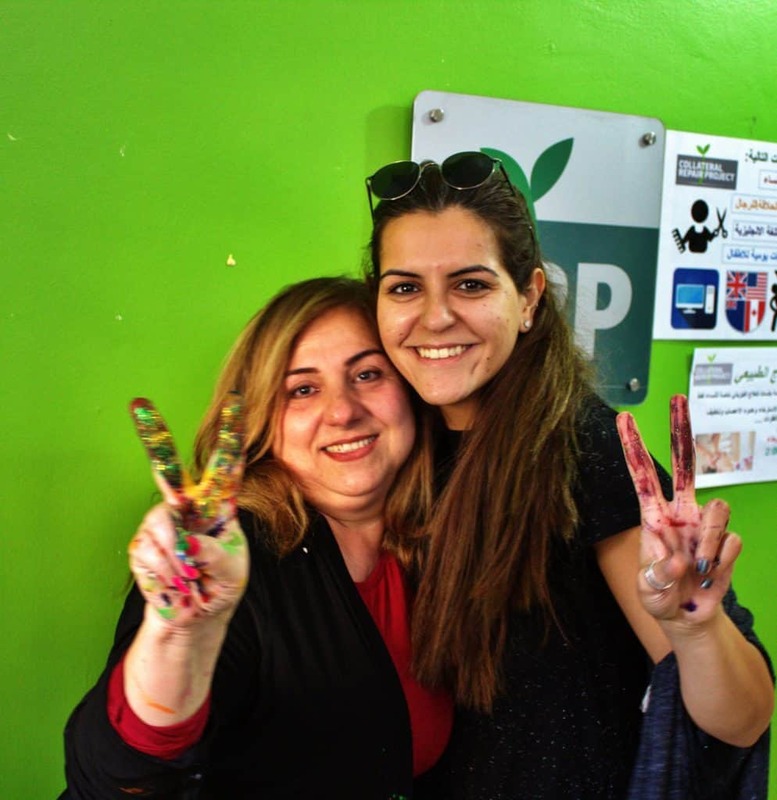 Ruba with her art teacher, Sara. 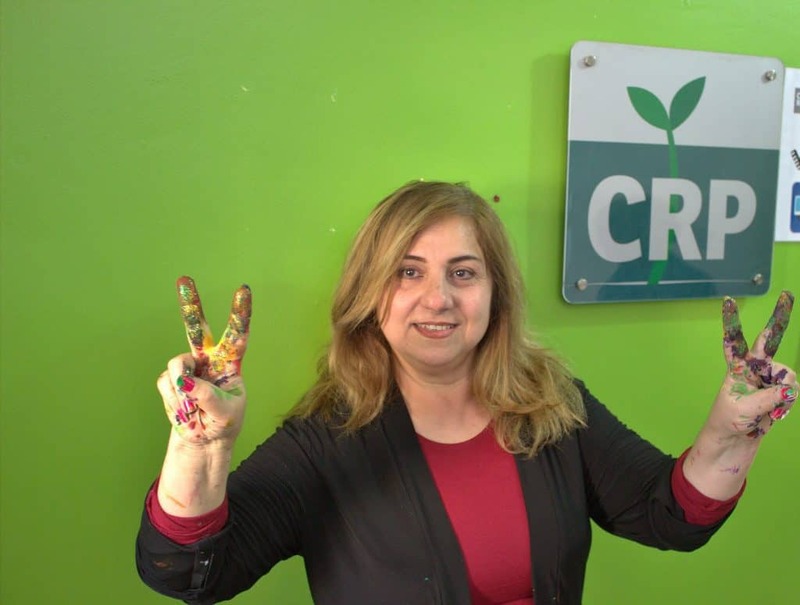 Depression doesn’t loom over Ruba’s head because she has found new ways to live, such as coming to Women’s Art Club at CRP. 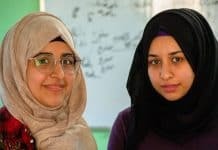 Ruba is now all smiles, even when she’s worried about how she looks, with splatters of colorful paint on her hands and black cardigan. She explains that each Sunday afternoon she eats lunch quickly so she can be in an environment that offers happiness and music. Ruba sheds tears as she openly discusses her healing process. “Ms. Sara lets us live in a different world that doesn’t have to do with sadness or envy or fear. Just art and hope,” she explains. The bright colors on her hands are representative of the new color she has found in her life and the positive way she releases the negativity she has built up from the previous week. Finally, she feels that she can look forward to a good future. She even carries this new attitude to her home. She laughs, saying that when she goes home, her family wants to see her artistic side, but instead they see the paint all over her shirt. It doesn’t take much time or even money to donate and keep CRP’s art therapy going. But it does take your help. Donate today. These sessions make a huge impact on Ruba’s and other refugees’ lives.